Are you a fan of spicy food? I sure am. Almost anything we make I feel would be better topped with jalapenos. Especially a burger. And this jalapeno popper burger has been on my mind for a while now. I think I first mentioned the idea to my husband around last years super bowl. Poppers are almost always one of the little appetizers that we serve and I couldn’t help but wonder what they would taste like on (or in) a burger. Along with the spicy little peppers I decided to use some cream cheese and bacon. Why bacon? Because bacon makes everything better. I wanted the cream cheese to have a warm and gooey texture so I decided that a stuffed burger was the way to take things. There is nothing like taking a bite and realizing there is a hidden treasure in the center of your burger. Start by heating your ovens broiler and lining a cookie sheet with foil. Set aside. Divide your hamburger in half. Shape both into fairly large thin patty’s. Mix the cream cheese and jalapenos. Pace in the center of one patty. Sandwich with your remaining meat. Pinch and seal the sides. Broil for 13 minutes on each side or until your burger is cooked through. 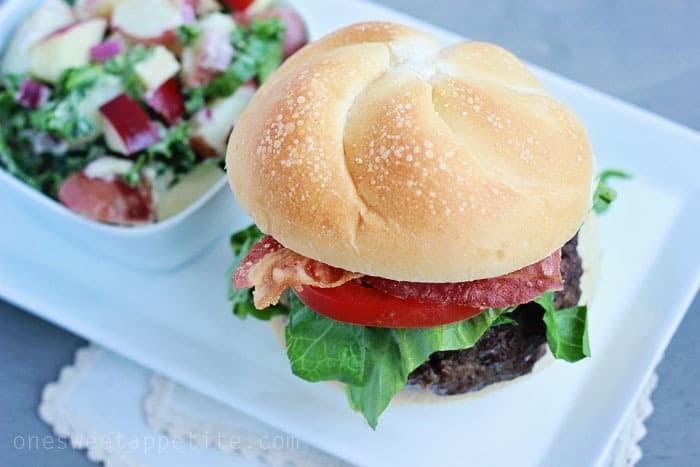 Top with bacon, lettuce, tomato, and any other ingredients your hearts desire. The flavor of this burger is phenomenal. It’s just like I imagined it would be. 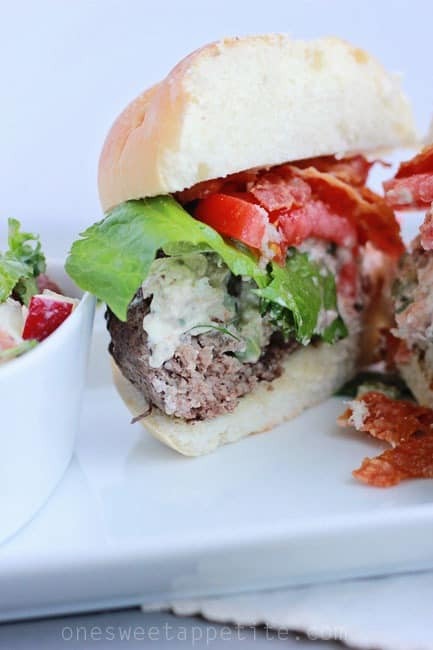 The cream cheese and jalapeno add a slight spice that kicks the flavor into overdrive. It’s a jalapeno popper at it’s finest! This is the end of our burger week and I have to admit… I’m a little sad to say goodbye! Make sure you stop by Tried and Tasty for her last burger, the black bean veggie burger! What a great idea for a burger!!!! 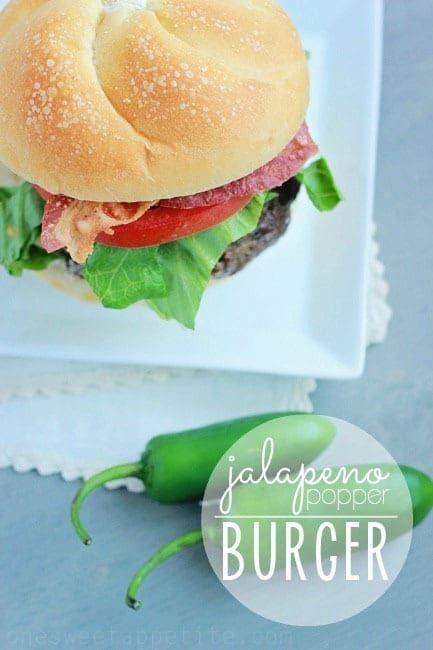 I love the ‘jalapeno popper’ twist on things – I bet this was so yummy!